Before I tell you about my new smoothie routine, I wanted to let you know about a contest over on Oh Happy Day! Jordan is giving away a 7 night trip for two to…. Go to: ﻿http://ohhappyday.com/2011/06/goes-to-paris/ to enter, but if you win, you have to promise to take me with you. I’ve never been to Europe and am DYING to go. Ok, on to the smoothie talk. Ever since I saw this post by the make-up artist on Secrets from a Stylist, I’ve been wanting to switch up my morning breakfast routine to include a healthy smoothie instead of the decaf tea and carbohydrate I’ve been having every morning. Yesterday, I finally commited and got myself a single serving blender with handy travel lid and all the makings for a couple of different smoothies. Today I tried one with frozen mango, banana, OJ, and kale. The blender took a little while to get warmed up (or the mango took a while to defrost enough to be blended), but once it got going, I added more of each ingredient until I got the consistency I was looking for. I ended up using almost a whole banana, about a half of the package of mango, maybe a third of the kale you see in the picture, and about a cup of OJ. This is what it looked like when it was done. The nice thing about this blender (got it at Target for $15) is that the cup comes off and has a travel lid so you can drink straight from it. It even fits in the cupholder in my car. Since I never give myself enough time to actually sit down and eat breakfast in the morning, I always need something I can grab and go. This takes a tiny bit of extra time to prepare, but it is very convenient for drinking in the car on the way to work. 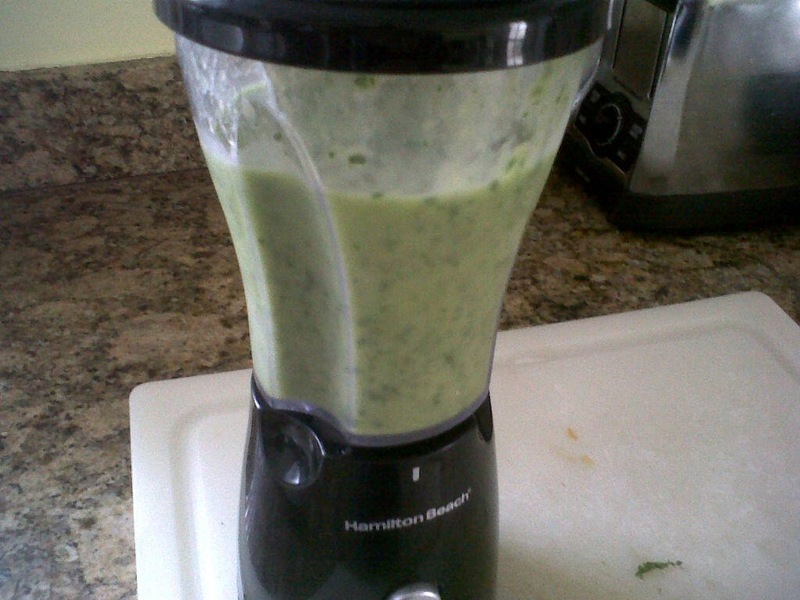 I know a green smoothie doesn’t look appetizing, but I promise it tastes delicious. I would never know there was kale in it by the taste. The texture, however, is a bit leafy (I was worried I had little green bits in my teeth before I headed in to work), but if you can get over that, you’ll love it. In fact, it tasted almost too good, so I decided I would add some spinach to it for tomorrow. Want some recipes for healthy green smoothies? Check this out. Scroll down to see a list of recipes, including the one I used today! Would you ever try a green smoothie?